This article is about the 1940s Prime Minister of Hungary. For the boxer, see Ferenc Nagy (boxer). For the 1990s politician, see Ferenc József Nagy. The native form of this personal name is Nagy Ferenc. This article uses the Western name order. 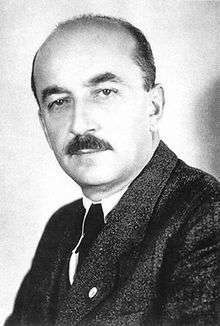 Ferenc Nagy (8 October 1903 – 12 June 1979) was a Hungarian politician of the Smallholders Party. 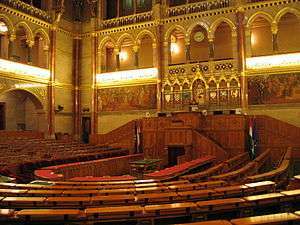 He was a Speaker of the National Assembly of Hungary from 29 November 1945 to 5 February 1946 and a member of the High National Council from 7 December 1945 to 2 February 1946. Nagy was reported to be of peasant origins. Later he served as Prime Minister of Hungary from 4 February 1946 to 31 May 1947. He was elected in 1946, in Hungary's first democratic election. As prime minister, he resisted attempts by the Hungarian Communist Party to gain complete control of the government. He refused attempts by the Communists to become a puppet of a Soviet backed police state, but resigned under duress (they had kidnapped his son). He gave up the premiership in return for his son and 300,000 Swiss francs. Subsequently he was granted asylum in the United States. Royalties from his memoirs helped him buy a house with a substantial garden plot in Herndon, Virginia (then an exurb of Washington, D.C.), there to live out his days. ↑ Heino Nyyssönen (2001). "Nagy, Ferenc (1903-79)". In Bernard A. Cook. Europe Since 1945: An Encyclopedia. Volume II, K - Z. New York: Garland Publishing, Inc. pp. 335–336. ISBN 9780815313366. Retrieved 27 May 2013. ↑ "A Market Place for All the World". The Age. Melbourne. Australian Associated Press / Reuters. 12 March 1959. p. 2. Retrieved 7 February 2013. ↑ Ryan, Nigel (16 April 1959). "Phantom City of Mussolini To Become Shopping Centre". The Windsor Daily Star. Windsor, Ontario. Reuters. p. 51. Retrieved 7 February 2013. ↑ "Nagy Purchases Farm In Fairfax County". The Washington Post. 4 September 1947. Nagy, Ferenc; Stephen K Swift (1948). The struggle behind the Iron Curtain. New York: Macmillan Company. OCLC 186311583. Nagy, Ferenc (1963). The statesman in the free world and in communism. OCLC 24070950. Audiobook on tape : Lectures, speeches; English. Nagy, Ferenc (1990). Küzdelem a vasfüggöny mögött (in Hungarian). Budapest: Európa : História. ISBN 978-963-07-5171-1. OCLC 24084729. Vida, István (1990). Ferenc Nagy, a Hungarian agrar-democrat in the first half of the 20th Century : (sketch of his portrait). Budapest: Történettudományi Intézet. OCLC 38784552. Retrieved 27 October 2008. Csicsery-Rónay, István (1995). Nagy Ferenc miniszterelnök : visszamelékezések, tanulmányok, cikkek (in Hungarian). Budapest: Ezerkilencszáznegyvenöt Alapítvány : Occidental Press. ISBN 978-963-7871-05-4. OCLC 36083793. Retrieved 27 January 2008. Csicsery-Rónay, István (2005). A történelem szolgálatában : (tanulmányok, cikkek, beszédek) (in Hungarian). Budapest: Occidental Press. ISBN 978-963-7871-26-9. OCLC 78888454. Retrieved 27 January 2008.